One of the things we love most about the farm-to-table movement is the opportunity to connect with our customers. The more we interact with the people we serve, the better we understand what matters most - and we know that Albertans want to know where their food comes from, and who produces it. Today, we’re excited to share the second installment of our Know Your Farmer blog series. Each member of our family plays a crucial role in making sure the day-to-day farming operations run smoothly, so we hope you enjoy getting to know us as much as we enjoy getting to know all of you! If you missed our last blog post, catch up with Daniel Doerksen here! Today, we’re happy to introduce to you…Lorin Doerksen! Q: Tell us a little about your history with farming. How did it shape your life? A: I spent a lot of time helping with farm work as a kid, and I was also a member of the Gem 4-H Beef club for 10 years. I always felt a strong connection to agriculture, but I decided to branch out with my education, and I studied environmental science at The University of Lethbridge. Throughout school, I gained work experience in agriculture. I then started a career in the environmental reclamation industry. However, as the old saying goes, “you can take the boy out of the country, but you can’t take the country out of the boy.” My wife Katie felt the same way, so we moved back to Gem after we got married, and soon after I began to get more invested in the farm again. A: In addition to raising cattle and growing crops, I’ve also been spending time developing our farm-to-table business, building Gemstone’s brand, and finding ways for our product to reach more consumers. I’m enjoying meeting new people and building connections. It’s fun to see my kids learning about agriculture at a young age. With the growing interest in local food, I know there will be lots of opportunities to get them involved in the future both on the farm and at the market! Q: What does the farm-to-table movement mean to you? A: I think it’s great that more and more people want a direct connection to the food they eat. People want to know how their food is produced and who’s producing it. I see it as a great opportunity to build trust with consumers; It’s important to listen to what they say, and I enjoy showing them what goes on down at the farm! 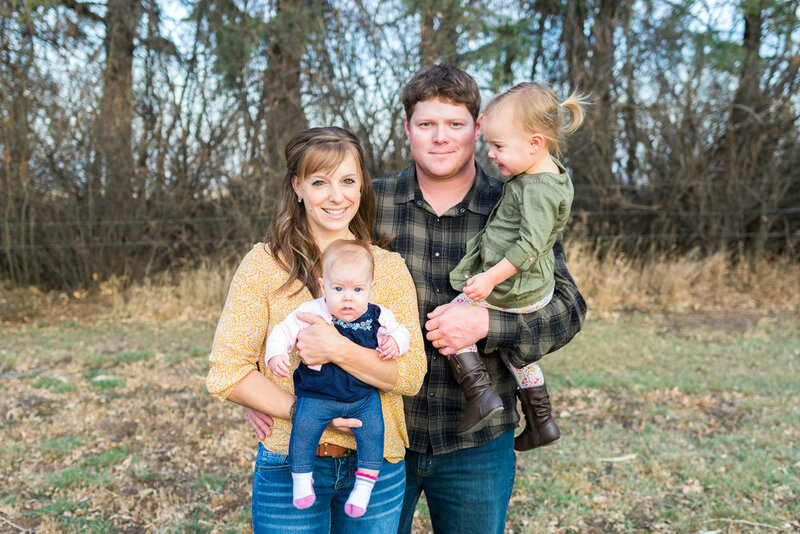 Farming is a way of life that people find intriguing, so it’s been fun to share the experience through social media, occasional farm tours, and most of all: supplying great beef! Q: What’s the one thing you’d like customers to know about Gemstone Grass Fed Beef? How is Gemstone Grass Fed Beef different? A: I find the health benefits that differentiate grass finished beef from grain finished beef to be very interesting. Various peer-reviewed literature suggests that a grass-based diet can improve the fatty acid profile and antioxidant content of beef. In particular, grass finished beef has higher amounts of omega-3 fatty acids, higher amounts of conjugated linoleic acid, and more Vitamin A and E.
At Gemstone Grass Fed Beef, we’re not interested in lean beef with a lower amount of fat. Our goal is to produce well-marbled beef that is consistently tender, flavourful, and nutritious. To achieve that goal, we are focusing on cattle genetics, grazing management that will improve soil health, and growing nutrient dense forage for our cattle. A: Can’t get enough medium rare ribeye steak on the BBQ!